Cubchoo is an ursine Pokémon with a light blue head and neck. It has a slightly pointed head, with large round ears, shiny, dark, oval-shaped eyes, and a darker-blue muzzle. 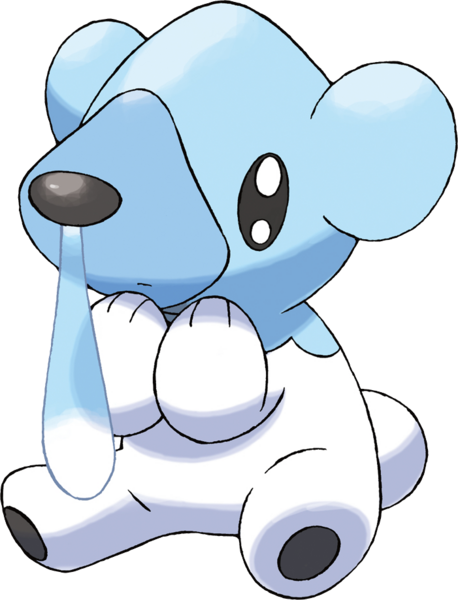 Cubchoo has a shiny dark nose, from which a considerable amount of light blue nasal mucus, the source of its attacks, droops. The lower part of its body is white, with rounded forepaws, digit-less feet with black paw-pads, and a small round tail. A Cubchoo's nose is constantly running. It inhales the mucus and uses it in its attacks. If it is in bad health, the mucus becomes watery, which powers down its Ice-type techniques.